We are underway with color knitting here at Golden Needle. 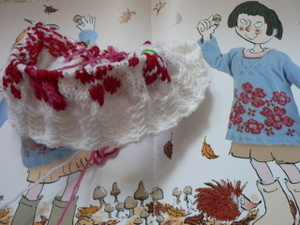 I got some confidence by knitting the adorable doggie hat from Lucinda Guy's "Handknits for Kids" and decided to dive into the Wildflowers Sweater. My first modifications were yarn choice (good change) and color changes (minor issue). Guy uses the Rowan 4ply - and me no do cotton-o knitting anymore. So I chose the Baby Ull Dalegarn, which worked quite well on the little doggie hat. I changed the color of the body to white, and wanted to keep the flowers red and pink, but did not find a suitable red (I am p-i-c-k-y about reds), so went with a dark fuschia (that looks almost red). As I already said in my doggie hat post, the white yarn is problematic because you can see the darker strands behind it. Does that bother me enough to change the color of the whole sweater? Nah, but I will keep it in mind for next time. Then I modified the hem, which is some kind of lace that I thought was not very neat looking. 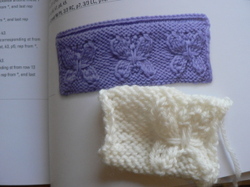 I tried a few things (including...ruffles...em, not my style), and although I love Epstein's book, a lot of the Knitting on the Edge samples are just too. Too ruffly. Too complicated. Too much. But I found this nice edging, which I will post more specifically about later (aka, when I don't have to get up to get the dang book). 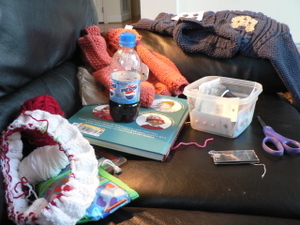 So here's where we are - row 10 of the pattern - whoopideedoodah. 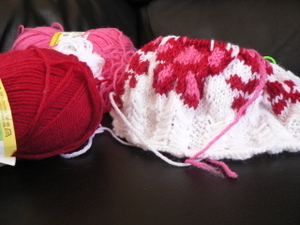 I also modified how the project is knit, thinking that it would be easier to do two stranded fair-isle in the round. (Incidentally, Guy even does her hat patterns back and forth, no comprendo why when it is so much easier to knit a hat in the round). Okay, let's talk color knitting. Does this look like Valentine's day vomited on my blue jeans or what?! 1.) Tension - I am trying to disprove my cousin-in-law here, showing her that you do not need to knit like a robot to have even stitches. That works when I only have two colors, but with three, blech. The fuschia flowers are fine, but the larger fuschia and pink flowers are not even. 2.) 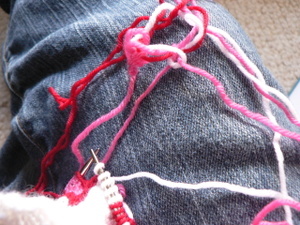 Yarn Tangle - It takes three to tangle. I am fine with two yarns, but the third presents a problem. Part of the issue is that I am not carrying the light pink all the way around, since it is used very locally, and doing the combo fair-isle/intarsia is not optimal. Overall, though, I am taking this sweater as a learning experience, and I will hopefully be a little better by the time I get to the top of the chart than I am now. In fact, I really am liking the color knitting, so I treated myself to Eunny Jang's Anemoi Mitten pattern. Oh, how I am a glutton for punishment.